Print your 10th grade math test before you start. It has 40 questions, but it is very comprehensive! For those who love math, I promise fun and challenges with this 10th grade math test. 1. What is the perimeter and area of the following running track? a. Write the sentence as a conditional and identify the hypothesis and the conclusion. b. Write the converse of the conditional and say if the sentence is a biconditional. c. Write the inverse and the contrapositive of the conditional and investigate the truthfulness of the inverse and the contrapositive. 3. The measure of an angle is four times as large as its supplement. What is the measure of its supplement? 4. Which line or lines are perpendicular to the line y = 6x - 8 ? 6. What is the measure of an exterior angle of a regular 10-gon? 7. 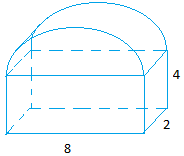 In the figure below, line n is parallel to line m. Find the measure of all angles inside line n and line m.
9. 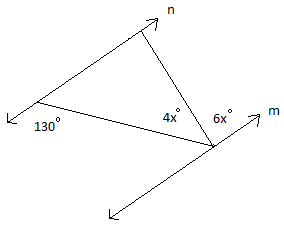 What kind of triangle is the one below? Find all 3 angles. 10. In triangle UVW, UV = 9, VW = 7, and UW = 11. Which angle is the biggest? 11. The surface area of sphere A is 4 times bigger than the area of sphere B. How big is the volume of sphere A compared to sphere B? 12. Graph poins A (-3, 3), C(4, -3), and D( 4, 3). Name the figure and show that segment AD is perpendicular to segment CD. Write equations for all 3 segments. 13. Show all medians and all heights of this triangle. No construction with straightedge and compass is needed! 14. The length of the hypotenuse of an isosceles right triangle is 10 inches. What is the length of one leg? 15. Find the volume and surface area of a rectangular prism 3 cm by 5 cm by 10 cm. a. Use trigonometric ratio to find the height of this building to the nearest tenth. b. Which expression will yield the biggest value? 17. Tell which congruence postulate can be used to prove congruence. Write down SSS, SAS, ASA, or AAS beneath each triangle. If you cannot prove congruence, write N/A. 19. What is the standard equation of a circle with center (3, -4) and radius 2? 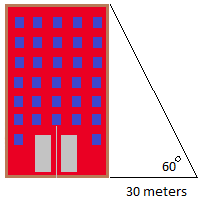 If the angle in red is equal to 50 degrees, what is the measure of angle x? b. Reflect triangle XYZ across the x-axis. 22. What is the volume of the figure below? 23. If the clock says 4:00 PM, what is the measure of the angle formed by the hands? 26. A man is 6 feet tall. When his shadow is 8 feet tall, the shadow of his son standing next to him is only 6 feet. Make a drawing and find out how tall the son is in feet and inches. When the length of 1 side of hexagon is 3 meters, the area is 23.38 square meters. What is the area if the hexagon has a side length of 6 meters? Two sides of a triangle measure 15 and 20. If the angles between these sides is 60 degrees, find the area of the triangle. Which statement will turn a parallelogram into a rhombus? a. The diagonals bisect each other. 33. The volume of a cone is one-third that of the cylinder. Try to explain why this is the case without doing any math computation. b. Suppose that the circle represents 1 scoop of ice cream and it weighs 4 ounces. Estimate how much of the ice cream is inside the cone. Hint: The portion that is inside is shown with a blue arc. 35. A boat is traveling west on a river with a speed of 50 miles per hour. The river flows directly south with a speed of 10 miles per hour. What is the boat's resultant speed and direction? 36. How many lines of symmetry are in a regular hexagon? 39. Which figure has rotational symmetry? Want a solution to this 10th grade math test? Add to your shopping cart and purchase a Detailed 53 PAGES SOLUTION and TOP-NOTCH EXPLANATIONS with PayPal.